We're excited that you're interested in coming to camp. Registration is now open. The button below takes you to our schedule where you can see the date, location, and registration status for each of our camps, and choose the one that fits you best. A number of them fill quickly, so it’s smart to register as soon as you can. You can also access our online registration system through any of the individual camp location pages. If you need a hand with your registration at any time, just let us know . Once a camp fills, a waitlist becomes available. We take at least a couple of people off the waitlist for nearly every camp, so it’s worth adding your name, particularly if you’re able to react quickly and make plans on short notice. It’s also smart to find another location that could work for you instead, and then if a spot ends up opening up in your original choice, we’ll check in with you to see if you’d like to switch. You’ll be prompted to accept a waiver as part of the registration process. If you’d like to view the waiver in advance, email us and we’ll send it your way. 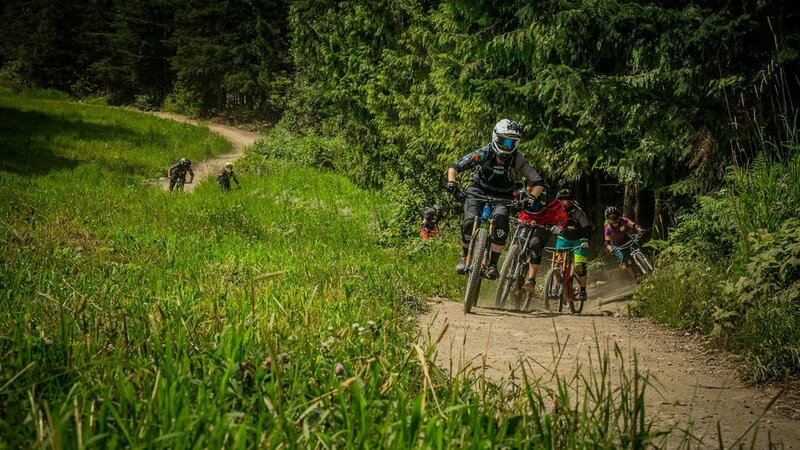 We spend countless hours before each camp organizing skill and riding groups, pre-riding trails, and setting things up to give each participant the best possible chance of getting just what they want. You don’t have to fill out your questionnaire at the very same time that you register, but the sooner and more thoroughly you can complete it, the better chance we have of creating a fantastic experience for you. Plus, if you want to do one early on and then submit an update later, we can work with that too. We send out a number of registration related emails prior to camp. To be sure you receive them, please add info@dirtseries.com to your address book or approved senders list. Our camps include full days of professional on-bike instruction, demo equipment from industry leaders, lunches and energy bars, evening sessions with maintenance clinics, snacks and drinks, and an impressive array of prizes from our sponsors. We offer a 10% discount for groups of six or more. Please contact us for more details. New this year, we also offer a 15% discount on a one-day camp when booked in conjunction with its corresponding weekend camp. Contact us for more details here too. We start planning our camps months in advance, work to create an exceptional experience for every participant, and set things up with the expectation that each camp will be full. Our cancellation policy reflects the fact that the closer it is to the camp date, the more challenging it is to adjust plans, and the less likely it is that someone can jump in to take an open spot. Up to two weeks before camp: full refund, less $50 administration fee. Six to thirteen days before camp: 50% refund. Five or fewer days before camp or “no show”: no refund. Please note that the above includes injuries and emergencies. In fact, a significant percentage of our cancellations result from these two causes, and often in the tightest timeframes. Please also note that camp registrations are non-transferable. Changes in participants, dates, or locations often hold many of the same challenges as cancellations. While we’ll always want to help, please be ready for the above policies to still apply. Even though the Trek Dirt Series camps are packed with value, we understand that there are still keen and deserving mountain bikers who simply can't fit a camp into their budget. Thanks to the generosity of Damien and Maggie Mills, and their Canmore-based training and consulting firm Runamuk Life, we’ll be offering twelve scholarship spots in 2019. Scholarships must be submitted a minimum of six weeks before the camp date. Recipients will be contacted approximately four weeks prior to camp.